I obtained seed for this variety from Italy. 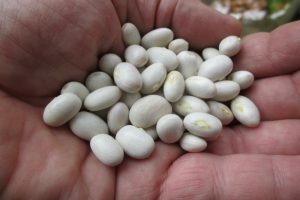 Burro means butter in Italian but these dry beans are not to be confused with what we call “butter beans” here in the US; those are lima beans. Del Burro is Phaseolus vulgaris, and suited for eating fresh as a shelly bean or dry. Italian butter beans are creamy (buttery) in texture when cooked. The plants are vigorous half-runners and productive for a long period of time. They are more difficult in areas with excessive summer rainfall and need to be kept off the ground. The first mature pods began to dry down 80 days after planting.